Teeth extractions are never pretty nor pleasant sights. However, a conflation of poor dental hygiene and malocclusion problems may necessitate the extraction of teeth. In this day and age, the use of extremely potent anesthetics and sedatives mean that dental extraction procedures have become so much simpler, less painful and more comfortable for the patient. 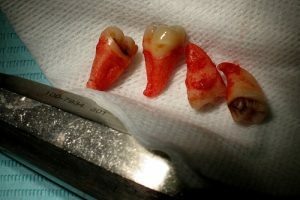 So you may not have any problem with the actual dental extraction in Atlanta GA, but what happens when the tooth is gone? For a couple of days after the procedure, especially a couple of hours after the extraction, you are at a risk for bleeding. If bleeding happens a few hours after the procedure, do not panic. Get a clean gauze or cotton and then bite into it using teeth close to the site of extraction. Doing so will exert pressure on the site and cause the bleeding to cease. You can also make use of a tea bag to control the bleeding. Tea bags are abundant with tannins, substances which help in the formation of a blood clot. If you find that you’re still bleeding even 45 minutes after you have bitten and put pressure on the site, call Dr. Ballard right away. The development of a blood clot is crucial in the healing process of the empty dental socket and is needed to prevent further bleeding. A blood clot will naturally develop, albeit slowly, starting from a few hours after the tooth has been pulled out. The goal is to ensure that the clot is not dislodged or else bleeding may develop once more. To prevent removing the blood clot, refrain from rinsing with mouthwash or gargling for at least a day after the procedure. The suction generated when you gargle will only force out the blood clot. Also avoid touching the area using your tongue. Doing strenuous activities right after the extraction will only cause the blood clot to be dislodged from the socket because of the force you exert whenever you lift something very heavy. Your dentist will most likely tell you to take the rest of the day off although you may be fit to go back to work a day after the procedure. And since you won’t be able to track if you are bleeding or not while you are asleep, prop up an extra pillow to help control bleeding and prevent them as well.